Jax Jillian was born in Albuquerque, NM but before she turned a year old, her parents moved east to Harrisburg, PA where she was raised. After graduating high school in 1995, Jax attended La Salle University (1999, B.A., Communication), Temple University (2001, M.Ed, Sport & Recreation Administration), and Central Pennsylvania College (2005, A.A.S, Physical Therapist Assistant). She settled in Philadelphia, PA with her husband and son before she became a writer. Jax found a passion for motion pictures at a young age when she remembers "getting lost" in films, and that passion ultimately led her down the path to writing. she loves "getting lost" in her writing and particularly loves writing heartfelt love stories with a touch of tragedy which she believes is the key to truly reaching readers. 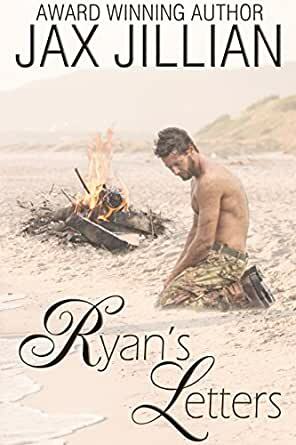 Jax is the author of Larkin's Letters and Ryan's Letters, two contemporary romance novels that have seen early success from reviewers, with both averaging 4.8/5 stars on Amazon and Goodreads. She is currently writing her third novel and aspires to write a screenplay one day. When not writing, she works full time as a physical therapist assistant and as a mom to her three-year-old son. This book made me feel like there is the possibility of a loved one to appear from heaven to there love on earth. 5.0 out of 5 stars5 Magnificent stars! Where Larkin's letters ripped my heart apart, Ryan's letter began to put the pieces back together, even though his first two letters had me crying my eyes out. His letters to Larkin were beautiful and heartbreaking as he poured his soul, his grief, his loneliness, his missing her and his love for her into them. He read the letters she had written to him and tried to take comfort in them, tried to do as she had told him to do and move forward and live his life. But how do you do that? How do you move forward when you heart isn't in it because it left with the one true love of your life. Ryan decides to write to her, and as he did with her ashes, he released each letter he wrote into the flames of a bonfire with the hopes that the ashes would reach her and she would be able to read them. And then she would visit him, giving him the greatest gift she could, some peace. That peace would only last as long as she was with him and when she would leave him, his grief would find him again. She wanted him to move on, to find someone to fill his life, his heart with life and love again. She wanted him to open himself up to Lux, his beautiful new neighbor, who held a grief and tortured soul of her own. They were two people who desperately needed each other, only he didn't see that. But what he could use right now is a friend, someone to help him with his loneliness, and Lux did that. I cannot recommend this book, this series, highly enough. They are a must read! 5.0 out of 5 starsA heart wrenching, ugly cry unforgettable love story.